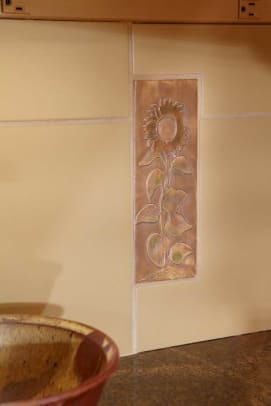 With a nod to Ernest Batchelder, artist Nancy Froseth designed and made the floral accent tiles and tile mural in the kitchen. 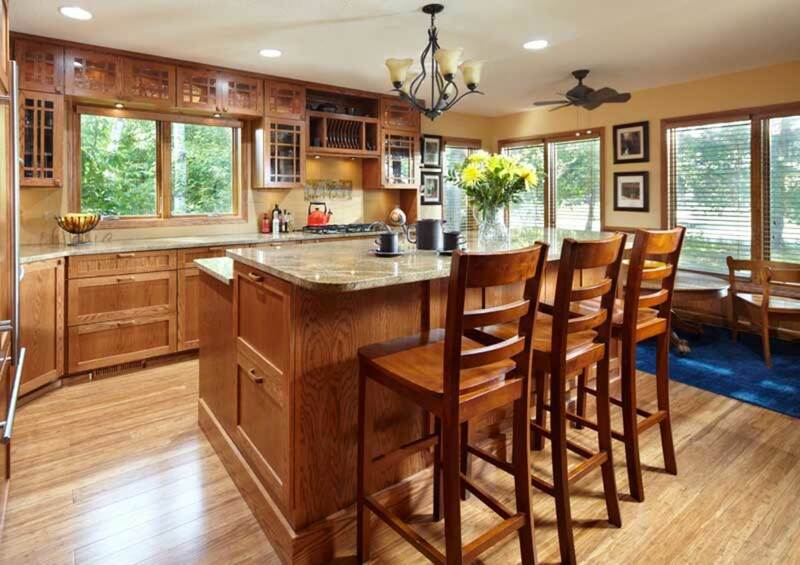 Some people plan a kitchen to take advantage of a view, or to create a flow for entertaining. 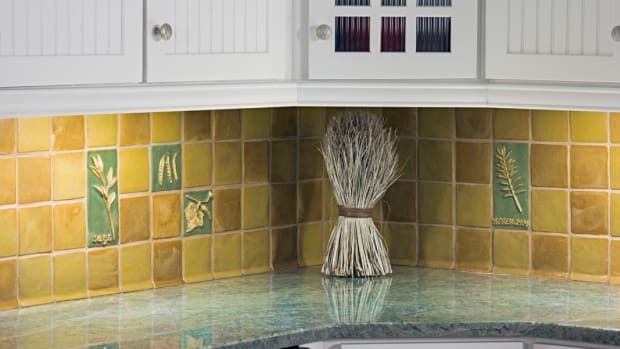 But musician and artist Nancy Froseth planned hers around the dishwasher. 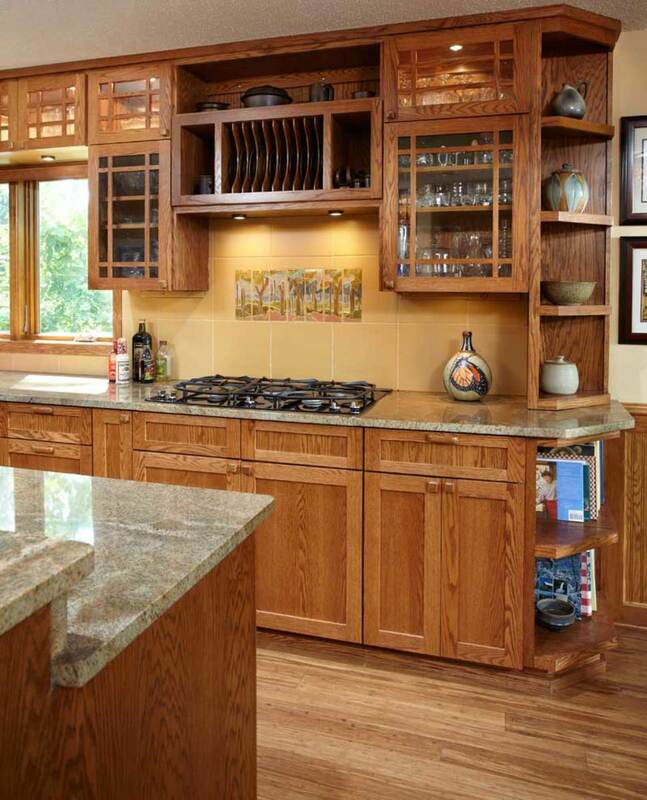 The machine, clad in the same finish wood as the cabinets, sits unobtrusively at one end of the large center island, next to the sink and just a step or two from the refrigerator on the adjacent wall. The range, with a plate rack overhead for everyday dishes, is opposite the sink. “Everything is handy,” says Nancy, who designs miniature ceramics and jewelry. 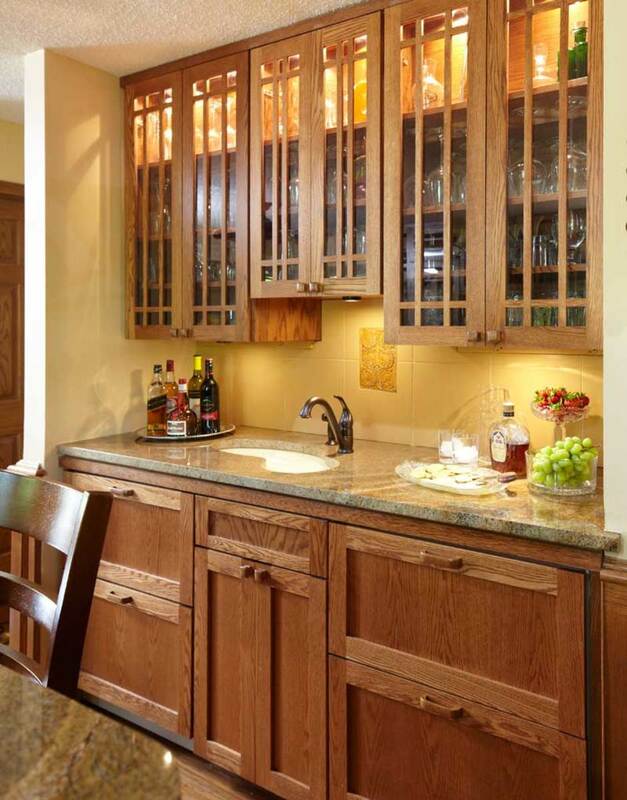 The kitchen offers ample storage and seating. Flooring is bamboo. Drawers easily outnumber cabinet doors. 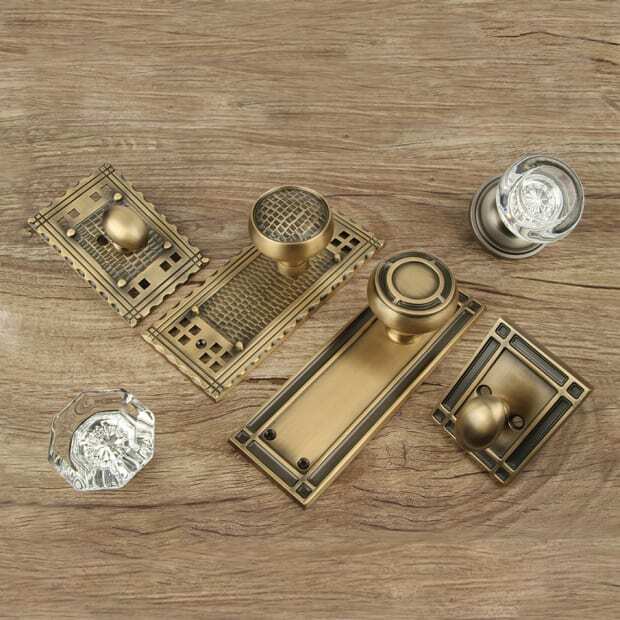 Equipped with a soft-close feature, the drawers hold everything from soup bowls and luncheon plates to oversized trays and snack foods, right where they’re most convenient. Most of the upper cabinets are glass-fronted or open, to display the family’s collection of Scandinavian glass and other decorative pieces. 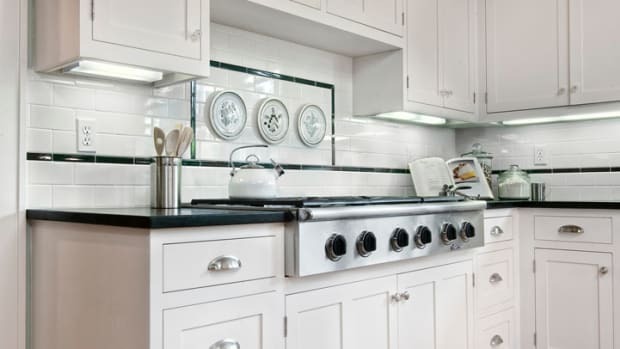 Nancy and her husband, Kent, requested the Arts & Crafts-style grid overlay on the glazed upper cabinets as a nod to details elsewhere in the house, which was built about 30 years ago by a Norwegian craftsman. The house is not old and has an open floor plan, but such elements as its staircase nudge it toward Arts & Crafts. 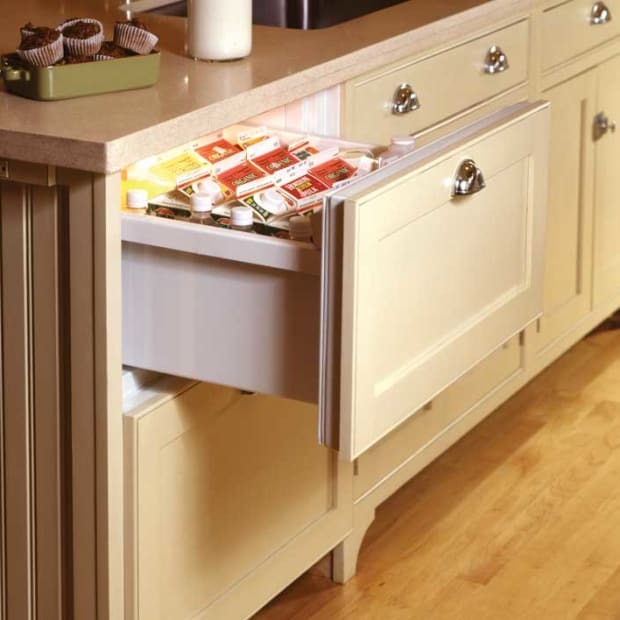 The bar has concealed refrigerator drawers on one side and freezer drawers on the other. 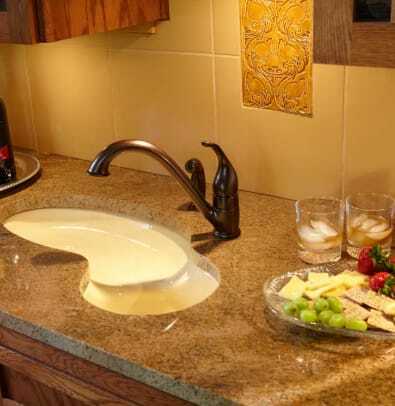 The biomorphic sinks (since discontinued) were made in a custom color. Opposite the island on the far wall is the bar, equipped with a smaller version of the biomorphic-shaped main sink. There are two icemakers. “We never run out of ice!” Nancy says. 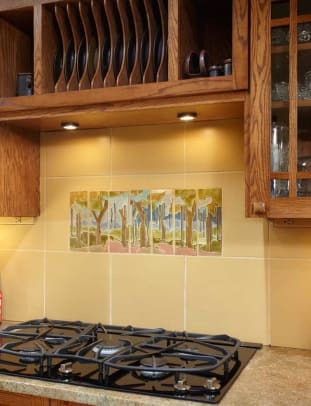 Tile backsplashes are accented with decorative tiles Nancy designed and made herself, after a conversation with Robert Winter, author of Batchelder Tilemaker, led to an invitation to see Ernest Batchelder tiles in person at his California home. “Bob Winter happened to have two copies of a book that Batchelder had written, so he gave me the extra one.” The book yielded the intricate design she calls “birds and nests,” now a tile over the bar. Troll-like caricatures peek around the scrollwork in the hand-carved Norwegian cabinet made by Hans Sandom. Kent Froseth, a numismatist, is the spoon collector. On his frequent trips to Norway for his coin work—Kent describes himself as “200-percent Norwegian”—he inevitably brings back at least one spoon. 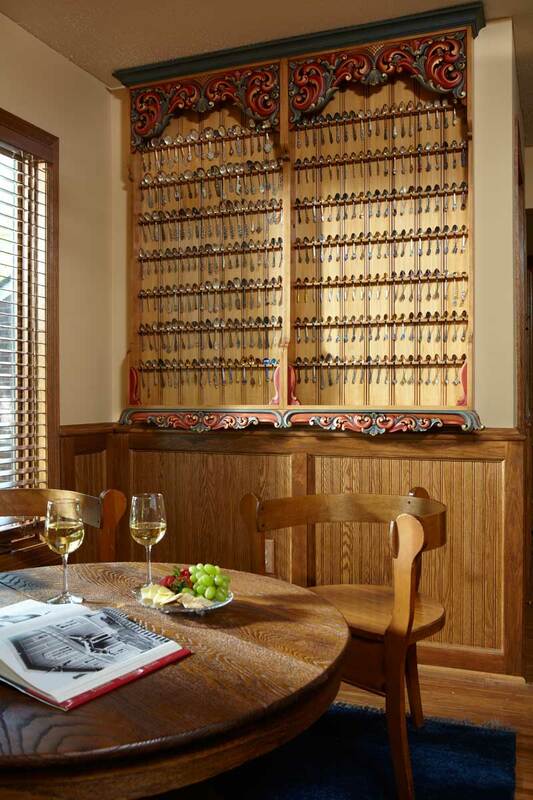 The rack holds about 200 spoons, barely a fifth of the total Nancy guesses he’s amassed. It runs in the family to like small things. Nancy began making miniatures when her aunt gave her a cardboard dollhouse and she made furniture for it. “My aunt said it was the best $3 she ever spent,” Nancy recalls. 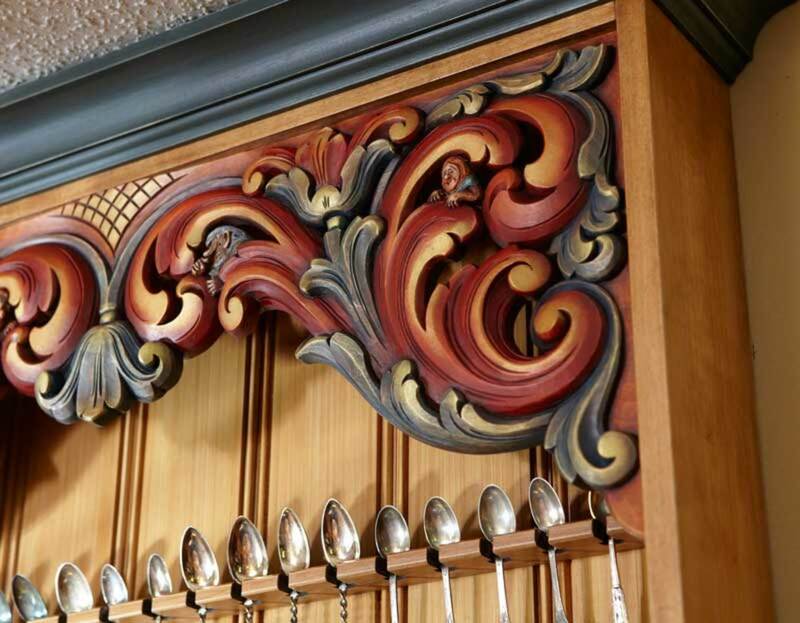 The hand-carved Norwegian cabinet, which holds 200 collectible spoons. Working in ceramic, metal, and wood, Nancy can and has designed just about anything imaginable in miniature, from houses to jewelry. 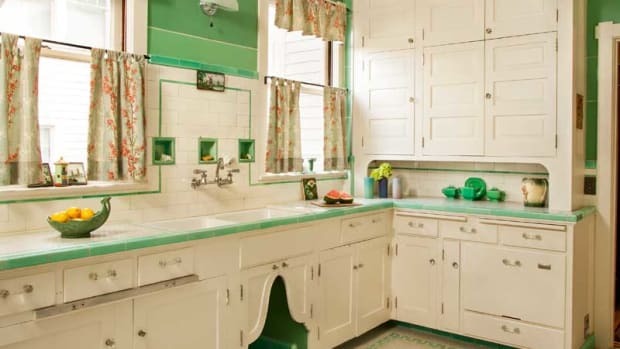 She designed miniature versions of the 11 floor–to-ceiling porcelain tile stoves (or kakelugnar) in the Turnblad Mansion in Minneapolis, home of the American Swedish Institute. (The petite stoves are sold in the gift shop.) 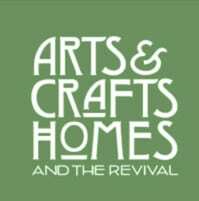 In the last few months, she’s cut designs for more than 50 houses. “I’m designing a Tudor one now. They are ¼" scale.” An ultimate goal, when she has time, is to build a traditional Norwegian hall house, a long, usually white house with two or three stories, one for each generation in the family. 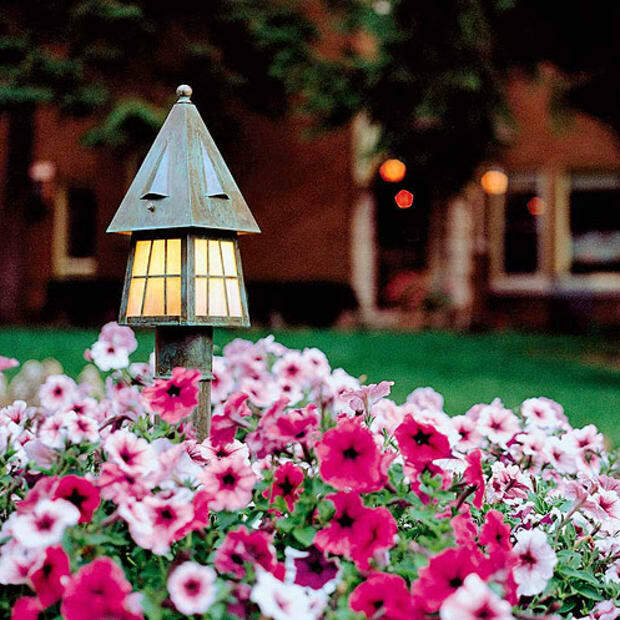 Not one to settle on a single discipline, Nancy Froseth is an accomplished musician as well as a miniaturist. She played piano, flute, and violin before branching out into early music; for years she performed with diverse ensembles, variously playing the krumhorn, viola de gamba, shawm, and rebec, among other wind and string instruments. Most of her time these days is spent in her studio, where she makes miniatures of houses, astonishingly detailed period furniture, and tiny tile in sizes from 1/8" to 1" x 2". 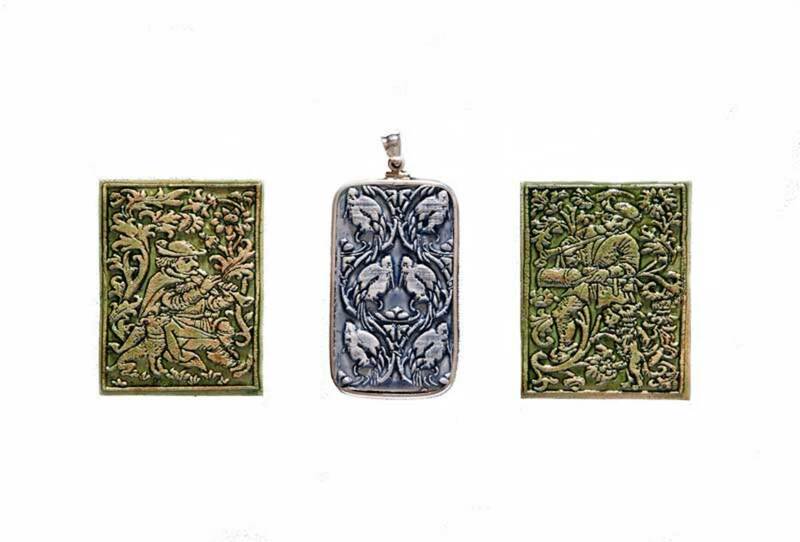 Her love of miniature shows in exquisite jewelry designs like pendants of medieval musicians strumming in the greenwood, rendered in fine metals. Other pieces are more contemporary, like the loon that is the symbol of the online gallery she created with her sister and partner, Carol Feste. The loon is of special significance to Scandinavians, she says, the Spirit of the North. Some versions are studded with diamond or sapphire pavé. Nancy Froseth&apos;s jewelry designs incude two medieval figures on either side of a pendant based on an original pattern by Batchelder.